Below is an excellent article by Fr. George Metallinos that portrays the truth about Constantine the Great and shows with conviction why the Orthodox Church honors him as a Saint and "Equal of the Apostles". It also answers the numerous critics of Constantine, among whom accuse him as being one of the most evil men in history. This is a transcribed lecture translated from Greek. 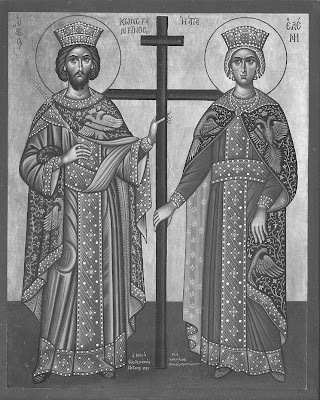 The reason that I chose this day for the presentation of my thesis is the feast of St. Constantine and his mother, St. Helen, which was just two days ago (May 21st). I repeat then, that ideological use of history, historical anachronism, out-of-order mentality and unfounded stochasticism suppress the historian and his research. Speaking of Constantine the Great, what are the sources from which we gather his information? The contemporary historian of the era, the father of ecclesiastic history, Eusebius, was tied to Constantine by personal friendship, and so his information must be judged differently and cross-referenced with other sources. If they cannot be cross-referenced, they remain testimonies but cannot be used to prove a point. Another contemporary historian and friend of Constantine’s son, Crispus, was Lactantius. He wrote The Death of the Persecutors, that is those who persecuted the Christians. But there are also St. Gregory the Theologian who in his epics dealt with the two Romes, the Old and the New Rome. He considers the second Rome as a link between East and West (I will return to this). These are the safest, most trustworthy sources. On the other hand, the only source that contains anything negative that is repeated to this day about Constantine the Great is the idol-worshipping gentile, the fanatical paganist historian Zosimos (425 - c. 518). He writes about one and a half century after Constantine. Eusebius is the father of ecclesiastical history, and he died circa 339 or 340 A.D. Constantine died in 337, these two are synchronous. Zosimos was a fanatic of the ancient religion and he wrote the book New History in six volumes which begins with Augustus and ends in 410. His sources are paganistic. The information he provides cannot be cross-referenced. Those who wish to take advantage of the case against Constantine are constantly using the elements provided by Zosimos. You can see that I’m trying to stay objective. It’s not important to us whether Constantine appears good or bad. The problem in searching this topic is to see what the sources tell us. To this end, Eusebius must be cross-referenced many times, but Zosimos must be checked more since he writes much later. He is very anti-Constantine and also extremely vilifying to Constantine’s person. Today, history accepts that Zosimos is not a true historian. He writes with bias, and he is rather more ethicological than scientific. There exists a fine article by Diddley that appeared in a German magazine in 1972 and also a splendid article using Diddley in a biographical lexicon of Mr. Tsakanikas. Zosimos’ fanaticism and his libelous attack on Constantine appear to be based on the decline of the ancient religion of the Roman Empire at a time when the empire acquires its greatest extent and is at its most unified and reaches its greatest glamour. Things are exactly opposite to what Zosimos is trying to present. It is important to note that the views of Zosimos are referred to by people, especially the neo-paganists or new idol worshipers, without critical scrutiny. They want to stigmatize Constantine and to have his work rejected and to undervalue his person. This is rather devious, after this nothing can be done, and there can be no justice, since these things are published and very often published illegally. Many times they send me articles from the internet, where some people praise my work, but most of the time they accuse me and attribute things to me that I never said or thought. Even so and so says in his book that I wrote certain things that are anti-Hellenic, which I never wrote. I hope he repents for these lies before he leaves this world. It doesn’t bother me, but it hurts his readers and the students who read his books. This is pretty much what happened with Zosimos. For example, Voltaire has a very negative stance with respect to Constantine. Gibbon is also against him, and we shall see this later. At the present time, diachronically and synchronically, who are they that attack and abase Constantine? Constantine Paparigopoulos, in the 19th century, the first great historian of the Modern Greek nation, (many of his works should be renewed in our day), his work is very valuable because, I say this for those who do not know him, Paparigopoulos has one asset: he is never stochastic and he follows historical sources. If a person can’t find all the sources, he may trustworthily follow them and study them as they are presented by Constantine Paparigopoulos. He says that the first group that hated Constantine as a defender of the new religion (Christianity), is the defenders of the ancient religion (Roman idol-worshippers), like Zosimos. Zosimos attributes all catastrophes of his era to Constantine, without proof. Today also, these catastrophes are attributed to him by the neo-paganists. How justified they are in doing so we shall see later. Second, from the 18th century on, proponents of the Enlightenment (Renaissance) have attacked Constantine. A certain opinion of Zosimos that they use is this: “He abandoned the dogma of our forefathers and espoused dishonor.” Do you see how things are relative? Christianity is said to be ‘dishonor’. And the religion of our forefathers is honorable! Of course the person who studies history, like he who is speaking to you, does not concern himself with sentimentality. But it is understood that a person’s mindset is influenced by reading these things, and it becomes impossible for anyone to have a good opinion on Constantine. In spite of all this, I will say that there are times that Zosimos either keeps quiet when it comes to worthwhile things that Constantine did or praises him, a few times for his virtues. St. Gregory the Theologian, in talking about Basil the Great uses the following adage, which may be attributed to him: “Even his enemies marvel at the virtues of the man.” A man’s assets are awe-inspiring even to his adversaries. When your enemy praises you, it means that you are worth something. It is not only a few times that Zosimos is forced to praise Constantine. The Enlighteners, especially Gibbon and Voltaire, attack and abase Constantine. Voltaire constantly abases Byzantium, while Gibbon, despite the title of his book, even though he doesn’t refuse that the name of the empire is not Byzantium but New Rome, is on the side of politics and geography (the West), but not the scientific and spiritual, of the Old Rome, and he talks about the Decline and Fall of the Roman Empire. According to Gibbon, the fall is due to Christianity. His work is memorable and important, but he writes with a certain bias, so you understand his basic drawback. In the perversion of things according to Paparigopoulos, papism did not play a small role. Even though Constantine is considered a saint in Roman Catholicism, especially among the Uniates, he is still hated for having moved the capital to New Rome and led old Rome to insignificance. If something like that happened to us, say if the capital were moved from Athens to Salonika, what would we southerners do? Now, this is significant: the name Constantine is derived from the Greek language. Konstas means ‘steadfast’, strength of character, from the verbs "istamai" and "istemi", to stand and to erect respectively. Thus the etymology is from the ancient Greek, but the name Constantine came from the West. From the schism onward, neither Pope nor any other political leader in the West ever took the name Constantine. It became the most hated name in direct antithesis with the East where it got to the point where several years ago, every person in leadership, to the previous king, to the current king, and later to the president of the democracy and all the leaders of the opposing political parties had the same name, Constantine. Even Malvina Karali, God rest her soul, told everyone with a little indignation that they should start using ancient Greek names, like Vrassithas and Epameinondas, rather than Constantine. It became our favorite name and even I have a son in law by that name. There are now more Constantines than Georges or Johns. That shows how beloved this name became for our people. The fourth group that stands against Constantine and his legacy are the western-minded people, who (amongst our people) always follow what the west says, no matter whether it’s right or not. Two or three biographical elements before I continue with some apologetical themes. His name was Imperator Caesar Claudius Valerius Constantinus Augustus—that’s his full name after 324 when he became monocrat. He was born on 22 February circa 280 in Nissa of Serbia. His youth was spent as a hostage at the court of autocrat Diocletian or at the court of co-autocrat Galerios. He was held hostage so that his father, who was Caesar, Constantine the Chloros, would be prevented from revolting against the autocrat. Perhaps he witnessed the martyrdom of St. George and St. George’s miracles in the East, since his love for martyrs must have been caused by a specific event. He was a brave warrior with many other assets, heroism being one of them. In the beginning he married modest Ninevina who gave him Crispus, his first child. For political reasons, as his father had done, he was forced to divorce Ninevina and to marry the daughter of co-autocrat Maximian, Fausta. Vostantzoglou, R.I.P., wrote about Fausta. From Fausta he had three sons - Constantine II, Constantius, and Constans and all three reigned. See how all the names are derived from the same root? Diocletian was the first Augustus and Caesar, and the second Augustus we might say was Galerius, his helper in the East. Maximian was also a co-Augustus, and his Caesar was Constantius Chloros, the father of Constantine, who was in Nissa. In 305, first of May, Diocletian and Maximian resigned, so Constantius was proclaimed Augustus in the West and Galerius in the East. Constantine then went to the West to be near his father. In 306 Constantine Chloros died and on 25 July of the same year, the army declared Constantine autocrat. We must consider something here. There was no inheritance of a kingdom back then, just the same as during the entire period of the Byzantine Empire, New Rome, meaning Romania, just as there was no inheritance of a kingdom back in Ancient Greece. Inheritance rules did not exist in the case of inheritance of position. The army or the senate or the people might allow the son of an emperor to succeed him, but it’s not because of the right of inheritance. That’s how Greek democracy worked. I have said this many times in this auditorium, the ruler was chosen by the people. That is democracy. Constantine therefore was nominated by the army and the senate to be autocrat. But Maxentios, the son of Maximian, in the same year on October 28 was nominated autocrat as well. In 311 Galarios died and was succeeded by Licinius who married Constantia, Constantine’s step-sister. On 28 October of 312 Constantine defeated Maxentios—we shall see how—on the Milvian Bridge, others spell it Moulvia Bridge. The senate then declared that Constantine is now first Augustus. In 313 Licinius defeted Maximinian. Now only two Augusti remained. Constantine was first and Licinius second. So in 313 the famous declaration of the Mediolanon (Edict of Milan) is given, and we shall see what its significance is. In 321 Licinius brings back the persecutions against the Christians, even though in 313 Constantine first had decided that the persecutions would stop. There is a battle between the two, and Licinius is defeated. In 324, Constantine becomes monocrat and the empire obtains unity despite its large territory, from Thoulin, which may be today’s Iceland, or at least from Ireland up to Persia and India. Thus it became a single country, with one central autocrat. In 325 he calls the First Ecumenical Synod together and in 330he inaugurates the new capital, New Rome. On 22 May 337 he dies at Drepano of Bithynia—in Asia Minor—which was the city of origin for St. Helen and that’s the reason why he named this city Helenoupolis. He was baptized by his friend, Eusebius of Nicomedia, in a white robe as a catechumen, and a little after that he got sick and died at the age of around sixty. His body was transferred and buried in the new capital, New Rome. Constantine was criticized by Zosimos for killing and eliminating his enemies. What do the sources say? Certain things that his enemies say and especially Zosimos who is the main source of criticism against Constantine will pretty much be left to conjecture. When something cannot be proven, any historian must only mention it, and avoid basing any conclusion on unfounded hypotheses or thoughts. To remain on a few characteristic examples, here’s the case of Maximian. Maximian wanted to become Augustus, autocrat, and he was persecuted by his own son Maxentios. He received help from his daughter, and he was Constantine’s father-in-law. In 310, however, he organized a conspiracy to overturn Constantine’s reign. That was the situation at that time. You know that every man, no matter how grand he may be, cannot stop being a child of his age. That’s why I told you that when historical anachronism is applied, it is a travesty to historical research. We shall interpret the events of that time, staying in that epoch and not transferring those events to our present conditions. Maximian spread the word that Constantine was killed in action against the Franco-Germans on the northern border, and then he took part of the army to his side and crowned himself autocrat. Constantine returned and Maximian locked himself in the castle of Massalia. Constantine took him prisoner, but then he forgave him through his wife Fausta’s intervention. There was a new plot of Maximian and Fausta herself this time, to kill Constantine. This attempt failed. Fausta then blamed her father. Maximian then hanged himself, because he understood that things would get very difficult for him. Many historians since Zosimos blame Constantine for this. Look, when someone is the highest authority, and not only political and administrative leader, but has total control of his office, he is called Rectus Totius Omnis, meaning governor, ruler of the whole world. Constantine then was Grand Juror. He was Pontifex Maximus. He did not give himself these powers; he received them from the Roman Empire. Every wrongful action had to be judged by the Grand Juror, who was selected by the army but checked by the senate. Thus it is not possible to hand all the blame to Constantine, just like the president of a democracy who signs the paperwork for a death penalty case that has been handed down by fair trial is obligated to sign it. If the man holding the highest office refuses to sign it, refuses to do what the juridical process decreed, you know what the repercussions will be. Second is the case of Bassian. I’ll avoid the details, because, in Bassian’s riot, here Constantine showed magnanimity even when the riot was discovered--again there was a plot against the ruler of the world. Is it possible that this might be a cold-hearted murder, as the historians consider Constantine? Every other ‘ruler of the world’ would have to be called a murderer, unless he is acting within the law. The Roman Empire was able to survive a long time because it acted in this way. The case of Maxentios, the brother-in-law of Constantine is typical. Maxentios wanted to be sole autocrat and turned against Constantine, invoking death by murder in his mind, of his father, Maximian. He orders that all statues of Constantine be destroyed. Constantine comes up through the Alps to Italy and the two armies meet at the same bridge of the Tiber River, two kilometers outside Rome. Here appears the well-known sign of the Cross up in the sky, as is described by Eusebius, at noontime. Constantine saw a Cross up in the sky and the letters that said “In this, be victorious,” not “By this, be victorious”. With this symbol you will conquer, you will win. Lactantius mentions this in Latin. And he says that it was a Cross that Constantine saw in his sleep - you see how there are differing versions - and he said that the words were “In Hoc Vincas”; here we see the “In” - "In this you will conquer". St. Artemios and the army, there are other sources, testify that they also saw this sign, thus the entire army saw it, not only Constantine. Whether he saw it in the daytime or in his sleep doesn’t matter, what matters is that Constantine had the symbol of the Cross put on his flag, and the monogram XP, Christos on a crown, and on his soldiers’ shields. Zosimos leaves this event without mention, and even though he may have been able to prove it wrong, it must be that he could not. He does not mention it – and all the other pagan writers do not refer to it either in their books. But later historians, Philostorgios, the hesychast of the 14th century Nicephoros Kallistos Xanthopoulos, Sozomen a 5th century historian one century after Constantine, and also Socrates the Scholastic, say that the words “In this be victorious” were in fact Angels, like the star of Bethlehem was, according to St. Chrysostom, or a supernatural event, or the uncreated energy of the Triune God. Sozomen also interprets it in his own way. On 28 October 312 there’s a battle. Constantine has 25,000 soldiers, Maxentions 100,000. Maxentios’ army is completely wiped out. One of Tiber’s bridges breaks up and many soldiers fall into the river and drown, and Maxentios is among them. Again Constantine is blamed. In my research, I’m interested in why they call him a “murderer” again. You know what it means to be a killer. If you say that because of the way Constantine attacked the bridge fell and Maxentios fell into the water and drowned, I believe it. But why is he a murderer? Not when there’s a battle for which there is a revolution against the highest authority. Three years after, Constantine built the Triumphant Arch which exists to this day in Rome. Now the contradiction that we give to Constantine’s enemies is that Constantine did not prosecute any of the soldiers of the opposing faction. He did not take any stand against them. Now you see what contradictions exist in the case of Constantine. Characteristic among these — to complete all the reports — is the case of the son Crispus and Fausta, the second wife of Constantine. In 316 he was celebrating the tenth anniversary of his ascent to the throne, in the palace. He received the news that Crispus had been arrested and incarcerated in the prison of Polas in Istria—that’s where John Kapodistrias and his family hailed from, Istria. Crispus was a serious and well-disposed young man with many leadership skills and charisma. At seventeen he received a high ranking in the army and was actually the leader of the Navy of the Empire. Don’t think this is impossible. Guarne, son of Josephine and adopted by Napoleon, at sixteen went to conquer the Heptanese with the democratic French. Here we see the hatred of Fausta. Crispus was thought of more highly than her three sons. She took it as his desire to ascend the throne. And another thing, Saint Helen loved Crispus for his talents, he reminded her of her own son in his youth. Then a satanic event takes place. One month before Crispus’ death, Constantine the Great had made a law against adultery. Not simply fornication, but adultery with a married woman. The punishment was death. With some false witnesses Fausta accused Crispus, first for a conspiracy against Constantine, and second with an attack against her, his step-mother, with immoral aims. Zosimos, the idolater historian - attention here - and John Zonaras in the twelfth century, accept that these accusations are baseless, and serious researchers accept that there is no proof to these accusations, only conjecture. Constantine’s dilemma in this case was analogous to the great lawmaker of Hellenism - Zaleukos. In the seventh century, Zaleukos —“Zaleukos” means “thoroughly white” (meaning very clean, righteous) - who was a contemporary of Hammurabi, gave the first Hellenic code and is more ancient than Solon. He had a law which said: "The accused and arrested for adultery is condemned to losing two eyes". The first person arrested for adultery was Zaleukos’ son. The king came along, like Constantine, to try him in court. What should he do? Should he blind his own son, whom the army wanted to succeed him as well as the people of the city? Thus, Zaleukos wisely asked the participants in court as to how many eyes does the law require in this case as punishment? They told him two. He told them, there you go, one of my son’s eyes, and take one of mine. He was blinded in one eye so that he wouldn’t take both from his son. Constantine did not execute Crispus; he simply put him in jail. The young man was put to death in an unknown way, and no command by Constantine was ever found that condemned him to death, as there should have been. Historians tell us that the only person who could use the emperor’s bull was his wife Fausta, and this execution is attributed to her. Helen returned from Rome and found out about Fausta’s conspiracy and revealed it to Constantine. Constantine then ordered that Fausta be arrested. Zosimos then tells us that Constantine ordered her death by drowning in her bath with hot water. A few days ago I received an article where an enemy of Christianity repeats what Zosimos wrote, without any other sources, without any reference to this event. This judgment of Constantine remains unproven. Ieronymos disproves this myth of Zosimos. A church historian (366 – 419 A.D.), an excellent Hellenist, he had lived near the Fathers in the east, and especially St. John Chrysostom. He belongs with the Fathers, on the side of Orthodoxy. Ieronymos lived these events, and he gives us the information that Fausta lived on, for three or four years after the death of Crispus. How is it possible for the two events to be tied together? Even the historian Gibbon, in his history, contests this type of death for Fausta. Paparrigopoulos also disputes this theory. The events surrounding the deaths of Crispus and Fausta are again impossible to prove. One year after the Synod of Nicaea in 326, Constantine went to Rome to celebrate the twentieth anniversary of his reign. In the Capitol building he was called to offer an idolatrous offering - he refused. You understand that his refusal was felt like a thunderbolt, an emperor refusing to do his duty as leader of a pagan empire. We should also know, I’ll say this parenthetically, why Christianity was persecuted for the first three centuries. These persecutions have not stopped to this day. It was persecuted because it denied any other deities. In the Divine Liturgy, the statement: “One is holy, one is Lord, Jesus Christ”, came into the liturgy early, even as early as the first century. “One is Holy” is the answer to the Jews, that there is only one who sanctifies - the Triune God. “One is Lord”, one is king and emperor is directed towards the Romans. One is our king. This is repeated around the year 160 in the West by St. Polycarp, bishop of Smyrna, during his trial. What did Statios Condratios the ruler of Smyrna tell him? "Give offerings to the statue of Caesar." This is because Caesar was revered as a god on earth. The spirit of Caesar and the spirit of Rome were honored with statues and offerings, and they were considered deities. Thus Rome would not have objected if the Christians were to honor one more deity in the existing pantheon of deities. Horatio had said that at the time, there were more gods than people. Thus Rome wouldn’t have objected if the Christians had accepted the deities of Caesar and Rome. This is why the Christians were persecuted. It was considered illegal to them, to repeat the words of Socrates, to accept the gods ‘that the state’ considered to be gods by law. So for the pagans it was rather curious that the emperor, who was honored as a god, and Constantine to that day was considered a god, refused to offer the lawful sacrifice as was imposed by the religion of Rome. After having been present at the Synod of Nicaea, he could no longer accept these things. Also according to Zosimos, he caused the pagans to hate him, and they, in order to take revenge on him and to embarrass him, they disfigured the face on his statues. That is, they used every possible means to destroy his face, but he, peacefully, when told what had happened, put his hand up to his face and said: “Lucky for me, I don’t see any wounds on my face.” He did not persecute the pagans, however, he also did not try to cultivate a friendship with them. In his letters, he advised the citizens of the country and all the regions where pagans resided to turn to the Christian faith. How could the gentiles love him? The only people that he showed severity towards were the heretics. That’s why he exiled Athanasios the Great, and another time he exiled Arius. Every ruler, in every epoch, is only interested (per the common phrase) in three things - calm, order and safety. He wanted to avoid inopportune conflicts. This is why Athanasios the Great was exiled to the west, (according to many historians) since he was threatened by death from the Arians. Exiled to Rome in 335-6, and to Remida, today’s Prir, birthplace of Karl Marx. That’s where Athanasios the Great was sent, and thereafter had transfused to the West the monasticism of St. Anthony and St. Pachomios, i.e., the coenobium. Constantine did not do wrong to the pagan religion. According to Zosimos he even supervised the reconstruction of pagan temples. My colleague at the University of Athens in Philosophy, Polymnia Athanasiades, has written a splendid work in which she writes that immediately after Nicaea, Constantine - as emperor of the nation - had funded four temples - two idolatrous and two Christian ones. He wanted to keep the two sides balanced and not show favoritism, and wanted to ensure the equality and unity of his citizens. He also funded the churches that were created by St. Helen - the Ekatopiliani or “100-Portal” one on Paros island, the churches that exist to this day in Jerusalem, in Bethlehem, on the Mount of Calvary, also the monastery where St. Helen transferred a large portion of the True Cross, and many others. Forgive me, I see in this article (which I won’t read in its entirety) that the neo-pagans accuse us that there’s not just one piece of the True Cross, but that there’s an entire forest. Don’t think that whoever has a piece that he calls True Cross that it’s directly from the Cross of Christ. We have what we call phylacteries that have touched the blood of martyrs, or the wood of the Cross of Christ. These phylacteries and pieces of wood are sanctified, and these are called ‘True Wood’ but they are not a part of the Cross. There is a difference here. At the monastery of Xeropotamou and the monastery of Stavrovounion in Cyprus there are large pieces of the Cross. They are not among the little pieces that have been cut, but in this way the little pieces that come in contact with these larger pieces, have created phylacteries that have come into contact with the True Cross. Constantine’s father did not persecute the Christians, like Diocletian. Constantine followed his father’s example. The Edict of Milan is spoken of in the work of Lactantius and in Eusebius’ history. What does the edict consist of? It allowed for freedom of worship for any religion. It repealed all laws against Christians and had all churches that were confiscated returned to them, or if that wasn’t possible they were compensated. We spoke of the First Ecumenical Synod. Constantine also elevated Hellenism politically and culturally. Constantine used the language of Romania, the Greek Empire which spread from the West to the far reaches of the East. There were two languages, Latin and Greek. Constantine spoke Greek at the Synod and also at the one in 324 in Antioch. This is where he shows his humility at the Synod in accepting the Synodic institution where he told them this famous quote: “You are the bishops in spiritual matters, in the sacra interna of the Church. I’m the emperor, rendered by God as the person in charge of secular matters.” The Greek work ‘an eie’ means that if he wanted to, he could also be, since he was recognized as such by the other bishops, an administrator of the Church. We may conclude from later sources about the sacra interna of the church. The problem in the relationship between church and state today—is the same as that of Constantine and many other emperors of New Rome. I’ll talk about a couple more things and I’ll conclude. He changed the course of history with his religious policies and urbanization changes that he brought about. One of those was the ability of slaves to become free men. He did not end slavery, since it wasn’t a possibility back then, but as the apostle Paul said in his letter to Philemon, he changes the content of slavery. A slave can also be a brother, or a coworker to his master, since whenever a slave is considered a man, a coworker, he can no longer be an object for his former master. He is the first Roman emperor, or the first Orthodox emperor in history, since he’s the one who built New Rome, the new capital. In 326 he began to look for a new city. He was not satisfied with the Latin-minded environment of the West and he understood that the empire must be moved eastward in order to prosper. That’s where the game began, which lasted a thousand one hundred years and longer, and it is even played up to today. Hellenism has remained intertwined spiritually with New Rome, with the Ecumenical Patriarchate of Constantinople. Constantine at first selected Troy to be his capital. That’s where he wanted to build his capital, that’s what the historian Sozomen wrote. In the end he understood the strategic placement of old Byzantium, which at that time was in ruins. It controlled the passage to the Black Sea, the Straits of Bosporus. Paparrigopoulos, Gibbon, and many other historians attempted to measure the distance from Constantinople to Iceland and from Constantinople to China. The distance is about the same. Constantine figured that Constantinople was the center of the world. When he was telling his generals as to where the city limits ended, they asked him, “Where are you taking us, you are making the city too big.” Constantine said, “I can’t stop because someone else is leading ahead of me.” He’s saying that he is being led by divine intervention, by an angel of the Lord. Whether this is true or not is not our problem. The amazing thing is that he was clear headed enough and sharp enough to see that Constantinople would play a huge role in history being located in this part of the world. He is the one emperor who never lost any battle. He was never defeated, neither from within nor without. He put down the senatorial system, since it was to the point where they were more powerful than the emperor, he stopped putting prisoners to death by crucifixion, he renewed the rights of families, he put a stop to adultery, as we saw, he made laws which raised the position of mothers, he protected the family unit and children from men who abused their patriarchal authority, and young girls from being snatched from their families for forced weddings. He regulated the matters of divorce, inheritance, dowries, etc. His entire policy shows that he acted as a Christian. He wrote laws that punished those who caused the death of their slaves and he limited violence and painful punishment. And something extremely important for the 4th Century - he outlawed branding on the faces of slaves. They used to brand their slaves with a heated sword. He used to say that the face is created in God’s image. How can a person’s face be marred like that? Constantine contributed in the triumph of Christianity. A terrible mistake by historians — let’s hope that is that it was done in ignorance — is that Constantine the Great proclaimed Christianity as the official religion. This was done on February 28 in 380, not by Constantine, but by the Emperor Theodosios I. Constantine ensured the freedom of all religions, whereby Christians were given the right to worship their God freely. Christianity did not become the State Religion. This is a huge historical mistake and a lie at the same time. Constantine Paparrigopoulos says that “Constantine could have acted otherwise towards Christianity, and he might have persecuted it rather than protected it.” Paparrigopoulos sees a rather unbelievable change of heart in Constantine in his stance towards the Christians. And here is another thing that is very significant. There is no politician ever who bases his views on the minority, but rather always on the majority. He normally strives to gain the majority of votes or get his ways approved. At the time of Constantine the Great, until the First Ecumenical Council where he shows his interest in Christianity, I ask, what was the overall number of Christians in the Empire? Eight to ten percent. That’s testified to by the superb work of Adolf von Harnack, one of the great historians of free ideology in Europe, in Germany, called "The Spread of Christianity in the First Few Centuries”. At eight to ten percent Christianity was a large minority. Constantine the Great is considered great by the Church and a Saint for this reason. To be a Saint means that he has the Grace of God within him, that’s what that means, it doesn’t mean that he’s infallible. He has the Grace of God, a living and perceptible grace. As an emperor, Constantine the Great presented himself as a commoner at the time of the Synod, accepting the most democratic system of history, which is the synod, the synodical system. In 311 and continuing in 313-314 a great conflict broke out, the schism of the Donatists. The Christians who belonged to Donatus and the other Christians who belonged to the regular bishop were fighting against each other as to whom the churches belonged as well as the plots of land belonging to those churches. Constantine, being emperor, should have judged the whole affair, being the “supreme judge”, but he made himself neutral and told Miltiades, a Greek (Hellene)bishop of Old Rome: “You have the synod, judge the affair by the synodic system.” When we say that Constantine the Great was president of the Synod, my colleague, professor Vlasios Feidas, has published a book about his presidency in the First Ecumenical Synod. The sources tell us, analyzed critically by Mr. Feidas and other scientists, that the true president of the Synod was Eustathios of Antioch. There is a difference between the president who coordinates the events of the Synod, and the president who recognizes the need for a Synod. The emperor was the only one who had the right to allow all the bishops to meet, especially since there were bishops from all parts of the empire, and not only to meet at the capital of the empire but in Nicaea of Bithynia. This tenet was in effect from the time of Old Rome and even at the time of Justinian, even during the German occupation. Could anyone travel without getting leave from the German administration? Or how about during the time of the Soviet Union, could anyone say that I’m leaving to go shopping in Europe without a police permit? People were afraid. This was even more so in effect during the Roman Empire. Constantine, however, and the emperors after him, gave their permission for the Synod to meet. Thus he called the Fathers of the Synod together, in excellent Greek - he was fluent in the Greek language - and then he withdrew and the work of the Synod was carried out by the Holy Fathers, among whom were St. Nicholas, St. Spyridon, Alexander of Thessalonica (a deacon still), Athanasios the Great; you can understand what personages we are speaking about. Constantine did not preside over the First Ecumenical Synod; this is what is implied throughout Church history. People may say that emperors did exert their influence. But since there were Saints present in the Ecumenical Synods, ready to sacrifice themselves for the faith, there is nothing and no one that can influence them. That’s the problem that we have today. Can we convene an Ecumenical Synod today? If there are no saintly people left, there cannot be an Ecumenical Synod. If we don’t have bishops that fight for the faith in Christ and follow the Saints of the past, but rather any Synod that does take place in the future but goes against the words and the policies and the praxis of the saintly men of the past, will show itself (and I hope this doesn’t happen) to be a false Synod. From a lover of Greek learning and philosophy, Constantine the Great became truly faithful to the Sun of Righteousness, Jesus Christ. He became an advocate of the Christian faith, as was proven in 313 with the decree of Mediolanum, without, as I said, proclaiming Christianity as the official and unique religion of the empire. What is His Relationship with Christianity? Many things have been written about this, hundreds of articles, if not thousands. They talk about expediency, but I’ve already told you that Christianity was a minority among the religions. Our teacher, may he rest in peace, Andreas Fytrakis, in 1945 wrote his doctoral dissertation titled The Faith of Constantine the Great and the Last Years of his Life. Having studied the ancient sources and some of the newer ones, he tells of the honor that Constantine bestowed upon the martyrs of the faith. He fully accepted the theology of the Church regarding martyrdom, and that of the simple people of God. He prayed on his knees at the places of martyrdom of many early martyrs, he built a ‘Martyrion’ a place where he wanted the bones of martyrs collected, and he wanted to get all the bodies of the apostles collected and placed in one temple. In this Constantius, his son who succeeded him, did find the relics of six apostles. Another characteristic is that he desired to be baptized in the Jordan, when he learned that the Jordan’s waters have been sanctified due to the baptism there of Jesus Christ. Be careful with this: even though he was baptized at the end of his life, and didn’t know when that would be, as none of us knows when the last moment of his life will be, Constantine acted as the Christians of his era did. He is a child of his era. I want to ask you where did Basil and Gregory the Theologian commune when they lived in Athens? They did not commune. They went to church at St. Isidore’s church there at Lykavetos, but they were baptized around 32 years of age. People back then would visit the most spiritual people of their locale, and if they weren’t told that they have been purified in heart, they did not get baptized. You understand, that was common practice at that time. Who was Constantine’s spiritual father? Was it not Eusebius of Nicomedia? They were friends; they knew each other from idolatrous times. That’s why he asked at the end of his life from the bishop of Nicomedia, who lived between Old and New Rome, to be baptized. They say that he received the baptism of an idolater. Maybe, but God did what God wanted. If the man was an idolater, Constantine did not know it. Constantine simply had a great ascetic as another spiritual director, St. Kordoui from Cordoba of Spain. The Church honors Constantine not for the things they say about him, but because he helped the church in many ways. So that you may understand why we honor him open the Menaion (Book of Months) to see the services, and the troparia hymns that are mentioned in honor of St. Constantine and St. Helen. The first one: “…like Paul, your calling was shown forth from above…” When the apostle Peter went to Cornelius, he was saying to Christ: “Where am I going?” when He appeared to him in a vision. And he was told, “What God hath cleansed, that call not thou common”, don’t defile the things God has cleansed. When he went to Cornelius the Centurion, the Roman, he found in him with the experience of having seen God. Thus God had made all things ready! And Peter gave in and did what he must do; he baptized Cornelius who had much time in front of him to be baptized. Consequently, in this case, Constantine the Great, ‘received the calling from heaven’, as had the apostle Peter. This is very significant. Of course, someone told me, that is this for certain? Since it reaches the bounds of folklore, despite our having ancient sources which testify as to the vision or Constantine the Great’s life in God. What matters to me are the criteria of the Church in proclaiming him a Saint. Where do we stand? He did not only help, but he gave. He built churches, bell towers and other things. You know that Orthodoxy, in direct antithesis with Papism, does not make anyone a Saint. I ask that you forget about beatification. This is a blasphemy. There is no beatification in Orthodoxy or in the Holy Fathers. What happens in the Orthodox Church? It is the acknowledgement of holiness. God, through many manifestations such as myrrh-bearing relics which work miracles, and with other signs from above, proves that the person has indeed reached holiness. That’s when we honor him whom God has honored and shown to us. The third is that Constantine “kept the faith of Nicaea” in allowing the Synod to be convened and to decide things with God’s grace. This shows that he brought about the faith of the Orthodox Fathers of the Church. As for St. Spyridon, it is said characteristically that He reportedly converted a pagan philosopher to Christianity by using a fragment of pottery to illustrate how one single entity (the piece of pottery) could be composed of three unique entities (fire, water and clay); a metaphor for the Christian doctrine of the Trinity. As soon as Spyridon finished speaking, the fragment is said to have miraculously burst into flame, water dripped to the ground, and only the soil remained in his hand (other accounts of this event say that it was a brick he held in his hand). With this miracle St. Spyridon gives status to the Symbol of Faith. Constantine simply keeps the Orthodox faith, since he was inspired to self-abase and to submit himself to the Synodic institution. One last conclusion, a few words from Constantine Paparrigopoulos. I have studied Paparrigopoulos and that’s the reason I refer to him so often. He says: “Even if Constantine committed certain lawless acts, this is not due to ferocity of the soul, but because he was born and lived in times that had already established certain terrible customs and traditions. His predecessors and contemporaries did not respect any sacred or human laws. It is rather worthy of wonder that in defeating all these great temptations, he was able to comprehend and allow for the onset of the Gospel news." This is what Constantine Paparrigopoulos says. *I have made many corrections from the original source of this translation.